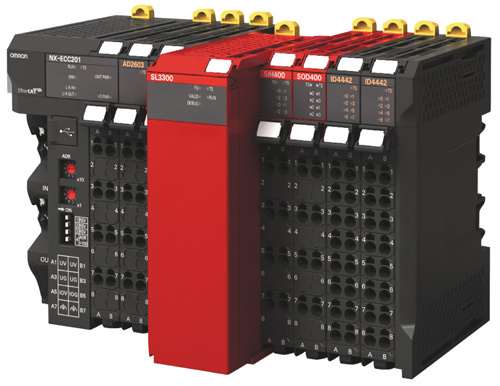 Omron Automation and Safety, Schaumburg, IL, introduces its NX series safety controllers that combine automation and safety on the same EtherCat network in a mixed I/O backplane. The design promotes flexibility and minimizes wiring costs. A single intuitive-software programming environment reduces machine- and safety-design time, while an auto- configuration restart function eliminates the need for tools or software to exchange I/O hardware. “The NX controller represents a decisive step towards the complete integration of safety, logic, motion and vision, in one software platform, on one network and in one control system,” says Matt Dodds, product marketing manager. Such functionality and flexibility make the safety controllers ideal for applications such as robotic workcells, flexible packaging machines and material-handling workcells with multiple access points. “Combining our integrated system, including safety components, from safety switches and safety sensors to motion devices with integrated safety functionality, provides significant benefits to machine builders who want to simplify and speed machine designs and improve performance,” adds Dodds.